"On your walls, O Jerusalem, I have set watchmen; all the day and all the night they shall never be silent. You who put the Lord in Remembrance, take no rest, and give Him no rest until He establishes Jerusalem and makes it a praise in the earth." Today, like no other time, God is calling His people to return to His land, to His Covenant and to His Agenda - Redemption! It is an invitation to those who hear His voice! We invite you, as well, to discover Him and what He wants you to know about His great plan. Master Minded Ministries is a vehicle that hosts Pro-Israel projects like: - creating educational opportunities of teaching and hosting events that will help the Christian community and the Jewish community to our roots of faith. We promote and support Pastor John Hagee and Christians United for Israel and the Nights to Honor Israel. We offer traveling opportunities to people who like to go on a study tour to Israel. We fund and support The Teacher and the Preacher radio program that is now heard in 3 different areas at 4 times on Sundays. We publish a newsletter and write articles for the the website. This does not mean we are hateful toward Arabs or other faiths. We "know in Whom we have believed..." and we are called to love and lay our lives down for others like Jewish Jesus did. We are Believers in Jesus (Yeshua Messiah) and we are now learning what that meant. As we discover our Jewish roots of faith, we are drawn to our brothers and sisters to gain a better understanding of what that means. The depth of insight into the mysteries and wisdom of God has been explosive. Our hearts have been blessed and challenged as we have gained the right perspective of the Jewish scriptures and have so much appreciated the guidance and love of our Jewish brother and sister Charlie and Marsha Schiffman. If you are interested in participating in these efforts, we welcome conversation. Our highest goal is to serve the Lord with a whole heart and to be obedient to His leading. If you have found us, then you are also on a journey of faith. Why Israel and Why Now? The heart of this ministry is really to find the heart of God. If you take the Bible seriously, you'll find out that He has watched Israel from the beginning. He loves her, He protects her, He chastises her and now He is rebuilding her. Does it make sense? Maybe not, but when has God ever needed to make sense to us? Doesn't He love you? Does that make sense? 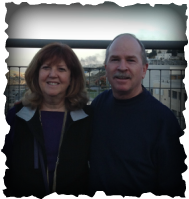 We have traveled to Israel for over 20 years and found God's heart is really faithful to His ancient covenants. "I will bless those who bless you and those who curse you, I will curse." Genesis 12. As we have come to find out - He means what He says! Why Israel? Because Israel bears witness that God lives! Why now? Because in His timing He is showing the world that He is moving in the hearts and lives of those who belong to Him. I actually like that a lot! I have also found out that God neither needs or appreciates our opinions and attitudes. He is doing what He was all about from the beginning: Shining His light on us so we know Who He is. He is God and God alone! Israel is in the hands of the Lord and as Christians, we stand with her and beside her as she rediscovers the Lord who provides - El Shaddai, the Lord who hears - El Shama, the God who protects - Jehova Rohi. We invite you to join us in praying for Israel and the Jewish people as they face the days of growing uncertainty. Pray! Pray again, and then Pray more! • You can consider a trip to Israel either with us or with another group. • You can consider supporting our efforts that includes helping students go to Israel with us so we can mentor them and invest in the future. • You can join us at a CUFI (Christians United for Israel) event. • You can consider becoming a monthly supporter of this ministry. • You can join us for a “Teacher and the Preacher” event. • You can pray for us as we seek to walk obediently in His ways. Donate Here! Contributions are tax deductible. Click the button above to donate through PayPal to Master Minded Ministries, a 501(c)(3) non-profit organization. Your electronic receipt may be used for tax purposes. What is God’s plan for the Jews in the end times?The Jewish people will be regathered from the four corners of the earth Isaiah 11:11-12. This is the most prolific prophecy in the Old Testament. Incidentally, if God has no purpose left for them, why would He go to the trouble of regathering them? Their state will be re-established (Isaiah 66:7-8). They will once again occupy the city of Jerusalem (Zechariah 8:7-8).